In these times of distress and uncertainty about the future, Tribuna Newspaper has decided to dedicate space to share the stories of those who make their lives an act of solidarity and compassion towards their neighbors. 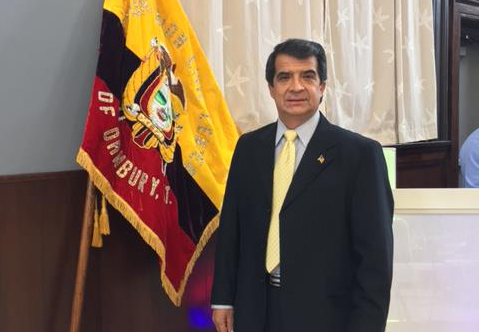 In this issue, our American Dream Series interviewee is entrepreneur and Ecuadorian Civic Center of Danbury President, Wilson Hernandez. Bringing hope and words of encouragement to many undocumented immigrants facing the harsh reality of fear and apprehension is one of the pillars that stimulate the work of our interviewee. In 1985, Hernandez decided to migrate to Uncle Sam’s land looking for answers to nurture his curiosity about the “buzz” that attracts people to the United States from all over the world. He wanted to understand why the country was highly consecrated in the imagination of so many people. “For me, coming here was not because of a financial emergency. I didn’t come to this country just because I needed a job. I was a teacher, from a middle-class family, living a very stable situation in Ecuador. I came more because of the excitement to see my friends and family members, migrating to another country,” he explained. The curiosity to get to know a new world instigated Hernandez to cross the Mexican border. He left his wife and two children behind with plans to return soon. Nonetheless, things did not work out as he had planned. “I had plans to return to Ecuador after 2 or 3 years and continue living my life there. However, you build a new life and returning becomes extremely difficult. After three years, I became a legal resident and I travelled to visit my family whenever it was possible,” he recalled. It took a long while for the Hernandez family to reunite and live together because until then, Hernandez travelled to Ecuador only during holidays and for a few days. After 15 years residing in the United States, his wife and two sons received legal status, and the family created roots in the country. Amid several lessons learned throughout the 32 years living in the United States, one was that, even in face of huge struggles, this country is full of opportunities and freedom. “I do not envision a life working only on my behalf. Life, in my opinion, is a permanent encounter in which we lend a hand to others in addition to achieving common goals that benefit all. I find great happiness in working with our community. I would not feel good if everyone else does not feel the same,” he emphasized. “We have to inspire hope in others. My message to all immigrants is that they should fight, become better citizens every day and fulfill their responsibilities. Let us ask God to bless our authorities so they can enact immigration reform that is comprehensive, fair and integral, allowing them to come out of the shadows. We cannot forget our roots, but once we have decided to come to this country to work, live and fight until the end of our lives, we should do the best we can. May we improve more each day. I hope our authorities won’t forget the stories, values and principles of this county. My motto is: I am grateful for the life that I love so much. And I will proceed working and fighting because, as I mentioned before, the life of an immigrant is one of permanent struggle,” concluded Hernandez.